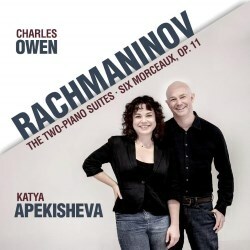 Rachmaninov’s music for two pianos or for piano duet forms an important part of his output, and it is natural territory for the co-directors of the London Piano Festival, Charles Owen and Katya Apekisheva, who are both professors at the Guildhall School of Music and Drama. This new Avie release combines the two Suites for two pianos with the attractive collection of six Morceaux, Opus 11, the latter for four hands on one instrument. The Suite No. 1 begins with a beguiling Barcarolle which gradually builds in complexity as it proceeds, and the clarity of the textures as presented here are the result of much careful rehearsal combined with the splendidly balanced recorded sound. These strengths, moreover, set a standard that can be experienced throughout the recital. However, it is the final movement – Pâques – which makes the strongest impression of all, with Rachmaninov’s favourite bell-sounds ringing forth in joyful sonority: a wonderful sound, vividly realised. The Second Suite is more ambitious still, and magnificently realised by Owen and Apekisheva from the opening bars. The exuberant enthusiasm of the performance reflects the very nature of the music, until in the final Tarantella the balancing of virtuoso rhythmic precision at a fast tempo with clarity of phrasing represents a veritable triumph. The six Morceaux of 1894, written when the composer was aged twenty-one, were composed in tribute to two recently deceased supporters: Pyotr Tchaikovsky and Nikolai Zverev. Be that as it may, Rachmaninov was trying to develop his career as a professional composer, so these duets were intended for early publication and sale in order to ‘balance the books’. Therefore the music is slighter than that of the two Suites, but always beautifully judged, and sometimes captivating, as when another opening Barcarolle, as in the Suite composed during the preceding year, sets the tone for the whole sequence. The accompanying booklet does not quite match the standards of the performances, alas. There are useful notes by distinguished writers – Jessica Duchen and Julian Haylock - but the font size is unnecessarily small and the layout leaves something to be desired.